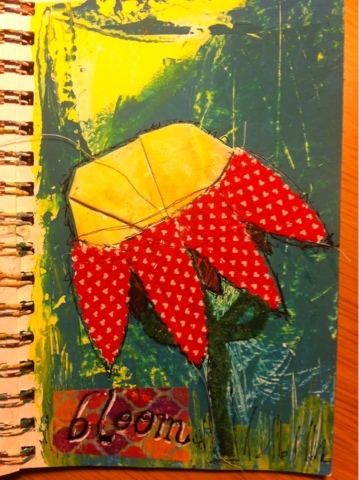 I've completed an art journal page using some petals I sewed a few weeks ago. I like how the leftover threads play into the finished product. For the middle of the flower, I gessoed a muslin scrap, then bunched it together and painted it using watercolor crayons. I twisted a green pipe cleaner into a stem and leaf shape. Using gel medium, I glued it all onto a background I'd created with various acrylic painting techniques. I colored in some extra petals using my Pitt pens, and finished the page with the word "bloom" penned onto Washi tape. I'm pleased with the result!